Sharon Blatt with some of her handmade, personalized blankets and pillows; her stylized dollhouse in the background became a replica of her own house. Sharon Blatt’s creations can be found worldwide. 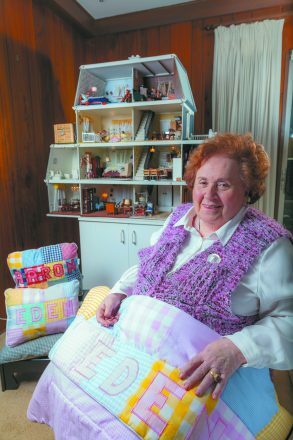 Above: Sharon Blatt with some of her handmade, personalized blankets and pillows; her stylized dollhouse in the background became a replica of her own house. Sharon Blatt of Farmington has always loved being a homebody. But rather than veg out with a book or TV show, she used her free time to create works of art. Today, her handiwork can be found all over the world. About 45 years ago, the former Detroit Public Schools art teacher crafted a personalized patchwork gingham pillow for her daughter Susan, then created less frilly versions for her sons Neal and Jonathan. Before she knew it, she was making personalized items as gifts for friends, and her hobby soon turned into a thriving cottage industry. “It just mushroomed,” said Blatt, 82, who attends Adat Shalom Synagogue in Farmington Hills. She named her business Sharynne Originals, choosing a stylized version of her first name. Blatt started selling her creations at Heaven to Seven, a gift shop in Birmingham, whose owner Barry Parson encouraged her to find a larger audience. But she gave it a go and the upscale retailer put in an order for 17 stores and featured her pillows and quilts in its baby gift catalog. Though she rarely sews anymore, Blatt keeps the business running with the help of her daughter. “I am just too old to do it, but once in a while I can squeeze out a pillow,” she said. The biggest challenge is finding people who know how to do the sewing and applique work, she said. Currently, a local woman is making the products, but she works fulltime sewing in an awning factory so can only devote so much time. One of Sharynne Originals’ biggest customers has been Doris Werner, 88, of West Bloomfield. Among the recipients are Werner’s many nieces and nephews (and years later, their own children) who live in Israel. When the family gathers for Sukkot, everyone brings their pillow and they all pose for a group picture to send to Werner. 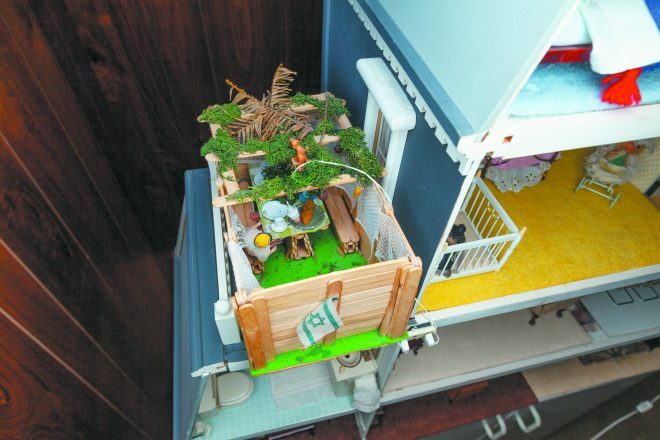 Blatt adds a sukkah to her dollhouse — and other holiday traditions — as the calendar progresses. Blatt’s creativity goes far beyond the pillows and quilts. Her handcrafted jewelry was sold at Saks and the DIA giftshop; but perhaps her most treasured creation, a large dollhouse, will never leave the family. The Blatts bought the dollhouse for a young Susie, but it soon became Sharon’s pet project. The more she worked on it, the more it began to resemble her own house. The children’s rooms are accurate replicas of their childhood quarters, while the front hall is filled with items that reflect the family’s Jewish heritage, including a Shabbat prayer book, menorah and Chanukah giftwrap. “Dad’s Office/Den,” the space favored by the late Ronald Blatt, includes a wee copy of a TRS-80 Radio Shack computer, which was launched in 1977. Many rooms include, naturally, tiny Sharynne Originals pillows, quilts, sheets and towels.